The Walking Dead has finally hit the point I was hoping it was going to get to. There’s so much going on it’s hard to tell what’s going to happen in the season finale – only two episodes away. I love that they are setting up a divide in the group. That separation in viewpoints was only widened in this episode only none of them know it. They are really messing with our expectations. At first glance it seems like Alexandria must be bad and Rick’s group must be good because that is what we’re used to, but it may not be the case. Was the leader of the construction crew not sincere when he recommended Abraham (Michael Cudlitz) take over the project? Does it not seem like Maggie wants to settle down and be comfortable? Carol redeems herself…kind of – There’s no doubt Carol (Melissa McBride) has become coldhearted over the past few seasons. It’s completely understandable considering the loss of her daughter and everything else she has been through since. But she thawed a little when she realized young Sam’s (Major Dodson) dad is abusive. That doesn’t mean she isn’t above taking matters into her own hands – or putting them into Rick’s – but it’s nice to see she still has some compassion. Carol has consistently proved to be the most interesting character on the show and this episode was no exception. 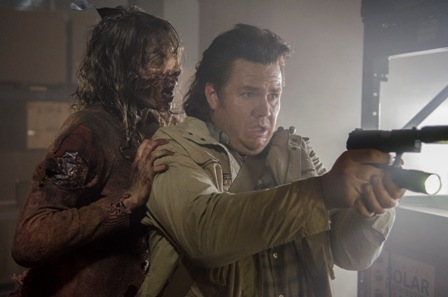 Eugene steps up – Eugene (Josh McDermitt) seemed to have faded into the background ever since his revelation about Washington D.C., but he was pretty awesome in this episode. He talks like he’s reciting poetry and he still seems to want to approach everything intellectually, but when it came right down to it he was finally able to spring into action. Unlike his Alexandria counterparts he wasn’t willing to leave anyone behind. Clearly there’s more to Eugene than meets the eye because the logical thing to do would have been to take off. 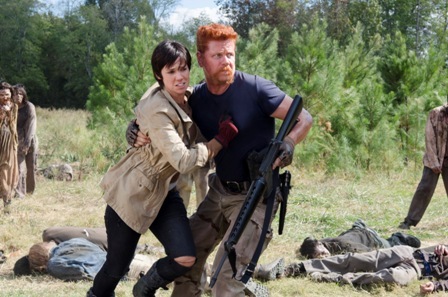 Abraham saves the girl – As it turns out, one of the ways the people of Alexandria have survived is to turn tail and run when they get into walker and that means leaving people behind. Like Eugene, Abraham was not willing to leave Francine (Dahlia Legault) behind when walkers overran the construction site they were raiding for supplies. Abraham hasn’t exactly shown himself to be selfless in his past actions, so this was a nice moment to show he can be heroic. It’s also painting the divide between the survivors. I’m not saying Rick wouldn’t go out of his way to rescue someone, but I think this showed specifically that Abraham is willing to work with the people of Alexandria. Father Gabriel is a turncoat – Okay, this is a weird one. 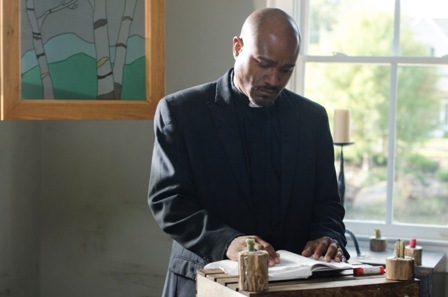 On one hand Father Gabriel (Seth Gilliam) is not completely off base in warning Deanna (Tovah Feldshuh) about the group, but I don’t believe his motivations are really for the greater good. In fact, I don’t really know what he’s basing his allegations on. He hasn’t really seen them do anything other what they needed to do to survive, so what’s his real problem? I think he’s hiding something or in complete denial about what has to be done sometimes. “Motherdick” – Best catch phrase ever. Where is Sasha (Sonequa Martin-Green)? – Just wanted a hint about what she’s been up too since her rant at the cocktail party. Where is Michonne (Danai Gurira)? – Same as above. It seems like since they are in closer quarters we could at least get a glimpse of everyone. RIP Noah – This was one of the most gruesome deaths they’ve had of a main character. 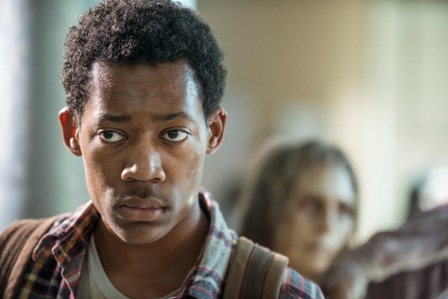 I’m feeling indifferent on Noah (Tyler James Williams) getting killed, but it’s hard not to think he didn’t get much of a chance to do anything. I wasn’t sad to see Aiden get killed, but I’m sure this is not going to his mother think better of Rick’s group. 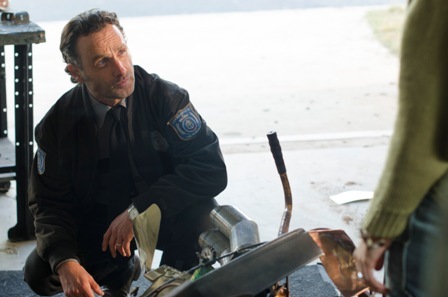 Pingback: Review: The Walking Dead Season 5 Episode 13 "Try"